This page is designed as a first introduction to Eco-Cement, for lay people or students to year 10 or 12. Eco-Cement is a new more environmentally sustainable type of blended cement which incorporates reactive magnesia and wastes that is more environmentally sustainable. Eco-Cement used to make permeable concretes absorbs CO2 and water from the atmosphere to set and harden. It can also be recycled back to Eco-Cement. Wastes such as fly and bottom ash, slags, plastics, paper glass etc. can also be included for their physical properties as well as chemical composition without problems such as delayed reactions. TecEco plan to make the magnesia that is used in Eco-Cements using solar energy in a new kiln that combines heating and grinding and captures CO2. 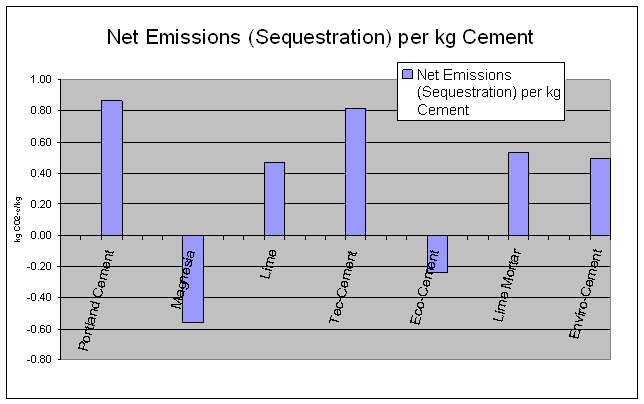 Eco-Cement is either carbon neutral except for process emissions which can be very low if non fossil fuel energy is used or negative (resulting in sequestration) if carbon capture occurs during manufacture as planned by TecEco. Given this production scenario Eco-Cement concretes have the capacity to become a huge carbon sink. Making the built environment a repository for recyclable resources (referred to as waste) as well as a huge carbon sink is an alternative that is both politically and economically viable. We want governments to use the power of law to force people to mimic nature and build with carbon to save the planet. Eco-Cements are made by blending reactive magnesia with conventional hydraulic cements like Portland cement. 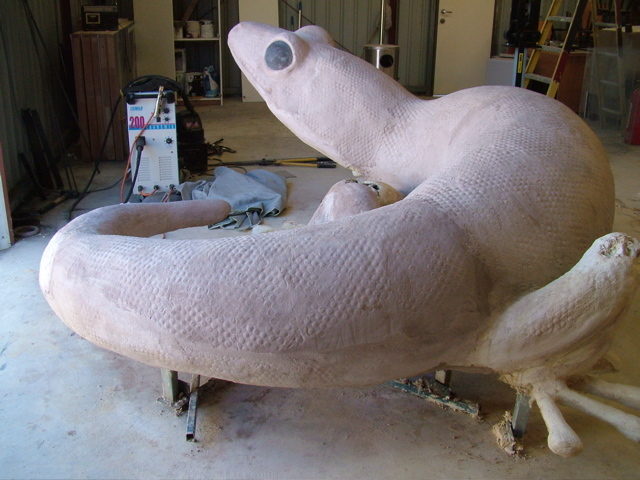 It is not recommended that large amounts of pozzolan are added to an Eco-Cement as the pozzolan will compete with the carbonation reaction of lime and tend to block the carbonation affect slowing it down. Eco-Cements are environmentally friendly because in permeable substrates the magnesium oxide will first hydrate using mix water and then carbonate forming significant amounts of strength giving minerals in a low alkali matrix. Many different wastes can be used as aggregates and fillers without reaction problems. The reactive magnesium oxide used in Eco-Cements is currently made from magnesite (a carbonate compound of magnesium) found in abundance. In future TecEco hope to make it from abundant magnesium in sea water using the Greensols process in Gaia Engineering. When added to concrete magnesia hydrates to magnesium hydroxide, but only in permeable materials like bricks, blocks, pavers and pervious pavements will it absorb CO2 and carbonate. The greater proportion of the elongated minerals that form is water and carbon dioxide. These minerals bond aggregates such as sand and gravel and wastes such as saw dust, slags, bottom ash, plastics, paper etc. Eco-Cement can include more waste than other hydraulic cements like Portland cement because it is much less alkaline, reducing the incidence of delayed reactions that would reduce the strength of the concrete. Portland cement concretes on the other hand can’t include large amounts of waste because the alkaline lime that forms causes delayed and disruptive reactions. The more magnesia added to Eco-Cement and the more permeable it is, the more CO2 that is absorbed. The rate of absorption of CO2 varies with the degree of permeability. Carbonation occurs quickly at first and more slowly towards completion. A typical Eco-Cement concrete block would be expected to fully carbonate within a year. Eco-Cement also has the ability to be almost fully recycled back into cement, should the concrete structure become obsolete. .
1. Magnesite (a compound of magnesium) is heated in a kiln to around 600 to 750 degrees C.
The lower firing temperature of the Tec-Kiln makes it easier to use free energy such as wind or solar or even waste energy and TecEco plan to make a kiln that does not use fossil fuels and in which the CO2 gases produced from the magnesium carbonate as it decomposes is captured and contained for further use or safe disposal. 2. Grinding in the hot area of the Tec-Kiln will result in increased efficiency. 3. The heating process produces reactive magnesium oxide (magnesia). 4. The reactive magnesia (powder) is added to a pre-determined, but variable amount of hydraulic cement such as Portland cement, and if desired, supplementary cementitious materials like fly ash. 5. The resulting blended powder is Eco-Cement. 6. When mixed with water and aggregates such as sand, gravel and wastes, Eco-Cement concretes are ready for pouring into concrete, pressing into blocks or other uses. Reactive magnesia is also variously known as caustic calcined magnesia, caustic magnesia or CCM. 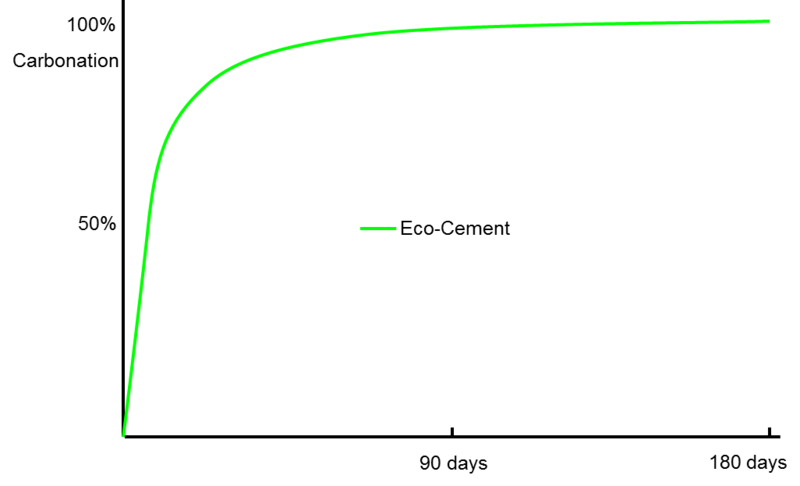 The temperature of firing has a greater influence on reactivity than grind size as excess energy goes into lattice energy. Technical information about reactive magnesia is available in the technical area of our web site.